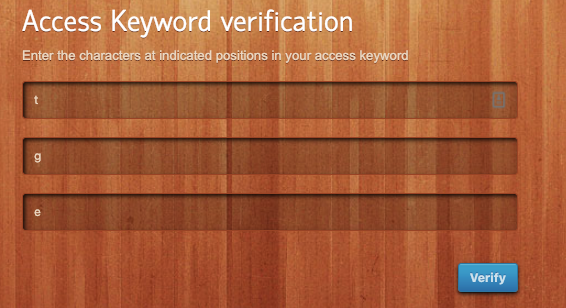 Access keywords is a two factor mechanism used for securing the GUI and the ssh backend . Ideally, it would be phrases that can be easily remembered. They should never be written down and should be stored only in your memory. Example of phrases that can be used for Access keywords would be a phrase like "top dog bites"
The access keyword can be set by the user as follows. The access keyword should have a minimum of 10 characters and at least 4 unique characters. Once set the web gui would ask for the characters from 3 different positions while authenticating. As you can see below, we need to enter the characters from the first, seventh and twelfth positions within the phrase. As, you can see, we had used the phrase "top dog bites",so we would enter the character that would come in the first , seventh and twelfth positions within the phrase, which would be 't', 'g' and 'e'. Note that, space is a character and would be counted. For, example the character in the fourth position would be the space character in which case we would simply enter the 'space' key. 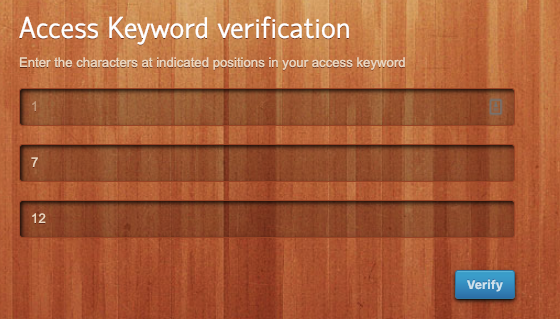 The access keyword would have to entered to access the backend shell as well. In this case, we would need to enter the characters in the fourth, eighth and twelfth position within the phrase. Looking at the phrase "top dog bites", it would be the space character, the space character again in the eighth position and 'e' in the twelfth position. Posted - Wed, Jan 30, 2019 at 5:00 AM. This article has been viewed 109 times. How to ensure that password are not recorded when ssh session recording is enabled to meet security compliances like PCI DSS 3.2 , HIPAA, SOX, SOC2, FFIEC, NERC CIP, ISO 27001 ? How can a user can set or reset Google 2fa in GUI? How to enforce 2 Factor Authentication on user login?